We have a much better look at the 2nd wave of 20th V-Pets! 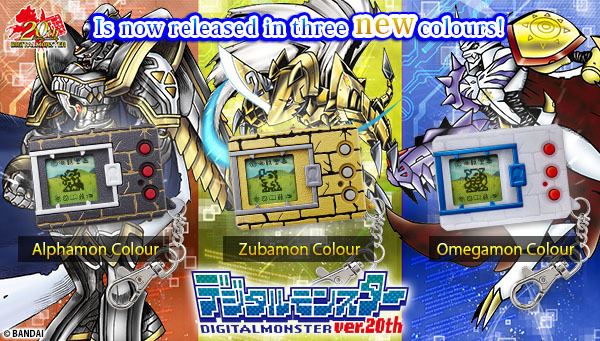 Also, they’ve revealed what the new colours are: Alphamon, Zubamon, and Omegamon. The 20th editions are designed to give you the nostalgia feels. The first 2 colours to come out were ‘Original Brown’ and ‘Original Grey’. Sure, they don’t have that chunky, rounded look like Digivices do. With this version, you get the biggest choice of monsters yet. Get a special Digitama egg to hatch a previous edition’s Digimon. 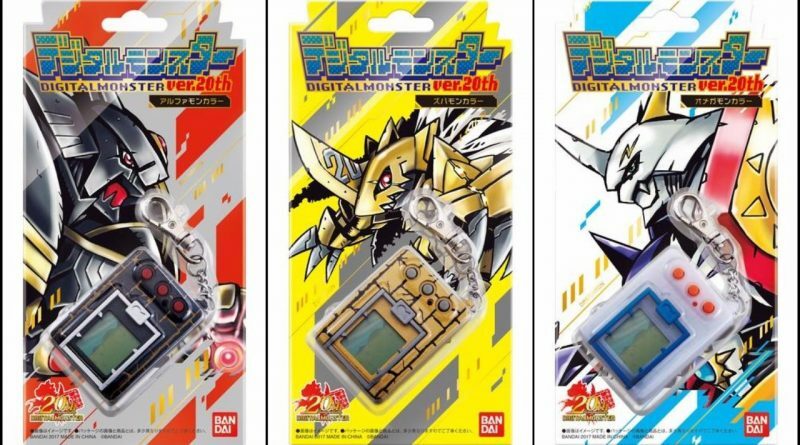 Every Digimon from ver.1 to ver.5 is included, and you can raise 2 of them at the same time. They eat together, they go to sleep together, and they, uh… poop together. Have fun cleaning that up! All features are available in brand new models of ver.20th. Feeding and training your Digimon is just the same as before. The digivolution timing’s much quicker than the original versions that came out in 1997. The first change used to take an hour – now it’s 10 minutes. And reaching your Digimon’s final form now takes about a week, down from 3 weeks. Apparently those times don’t count however long the monster spends sleeping, but that’s still fast. You can link digitalmonster ver.20th devices together for tag battles, swapping monsters, and creating new ones. Yep, tag battle means you can fight using 2 Digimon. Attacks are stronger when you time your button presses perfectly. If both of the monsters in your team are ultimate form Digimon, they combine. Into a huge, Transformer-like supreme fighting machine.